Lieutenant James "Rhodey" Rhodes of the United States Marine Corps is the best friend of Tony Stark, also known as Iron Man. 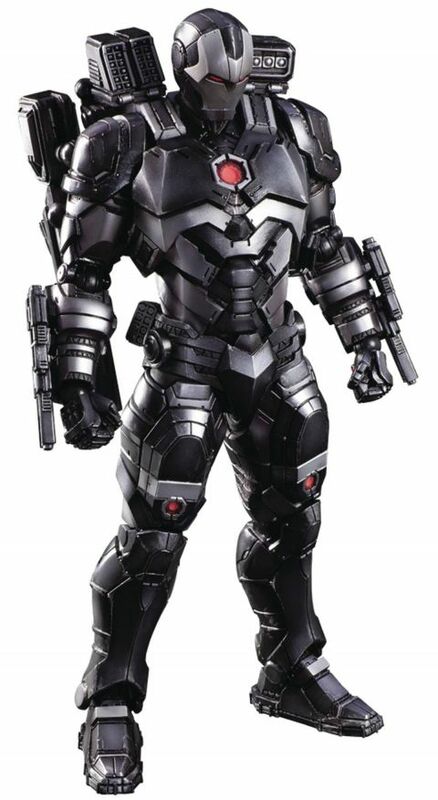 When James dons his mechanized suit, designed by Tony and similar in its look to Tony's Iron Man suit, he becomes War Machine! As one would expect from a top class military man, he is equipped with various powerful firearms. In this Marvel Universe VARIANT PLAY ARTS KAI, he comes with various types of exchangeable weapon parts. His weapons can be equipped onto both of his shoulders and onto the left and right of his back with secure ratcheted jointing, allowing for various ways to mount his weapons. The figure's form is rugged and heavily built, and the reactor at his chest is as if it is glows a vivid red color, contrasting with the gunmetal black iron color of the suit. The distressed effect on his suit that tells the tale of his many battles, also adds to the realism to this VARIANT PLAY ARTS KAI War Machine.